Modern slots offer a lot to many exciting players. And they are on a continual romp to invent new stuff. Some of doesn’t stick. And some does. One of the most popular features in most modern slots are the free spins. If you activate them, then you will get a number of free spins that can bring you wins. Note that this is in-game spins and not the same kind of spins as what also is referred to as free spins, bonus spins or extra spins, often given as a type of bonus to players. Different games will have different rules regarding the free spins. But in most cases, you will have to make a certain combination of symbols. Typically, these will be the scatter symbols and you will need to get at least three of them. The more you get, the bigger the number of free spins and multiplier bonuses that you’ll get. Read the paytable information and you will see if there are free spins and how to trigger them. And this is where the slots differ. Some will give you the opportunity to do a retrigger. Some won’t. In some slots, the retrigger feature will be limited to a certain number of free spins. And some slots will grant you potentially unlimited additional free spins. 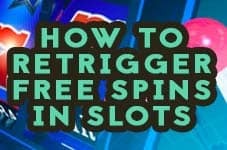 In most cases, you will have to get an additional number of scatters during the free spins. If you do this, then the retriggering will occur and you will get additional free spins for free. It’s in your best interest to seek out the games that can give you potentially unlimited respins. You can make a lot of money in this way. And that’s really all there is to the retriggering of the free spins feature in slots. We hope that you will come to experience the bliss that is this feature at some point. Find the games that have this feature and play them out.